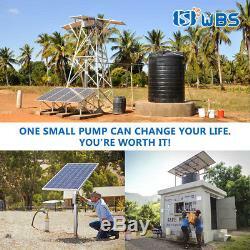 3 DC Deep Bore Well Solar Water Pump 110V 2HP Submersible MPPT Controller Kits. Permanent magnet DC brushless synchronous motor, designed for solar, with 15-20% efficiency improved. 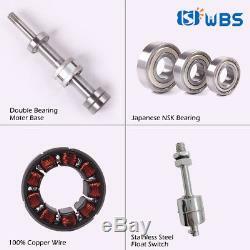 The double bearing motor base can work under more axial pressure. Alloy mechanical seal: Longer working life and high reliability. Intelligent water shortage protection: The pump stops working automatically when there is no water in the well, and automatically start working 15-30 minutes later. High waterproof grade: IP65, double seal effect in waterproof and leak-proof. Soft start technology: No impulse current, longer life for the pump motor. High voltage/Low voltage/Over-current/High temperature protection. What we get for you (Package Include). 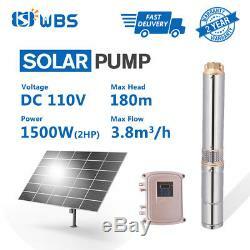 1 x WBS® DC stainless steel solar Pump with one 2m cable. 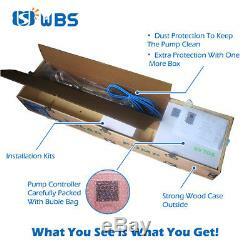 1 x WBS® Pump controller with MPPT function. 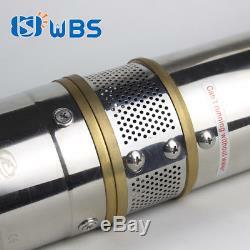 1 x Stainless steel float switch (sensor for the tank). 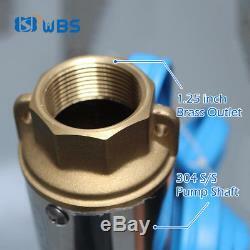 1 x Pump outlet joint connector. 1 x Splice kit for cable join. 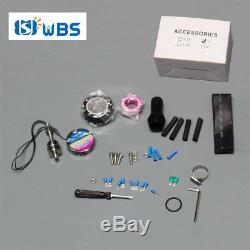 1 x Splice kit for waterproof. What You need to get by yourself. Therere some suggestions in the instruction book. A stainless steel wire (called safety cable) to hold. Or river, a float set up required. Pipe from the pump to. 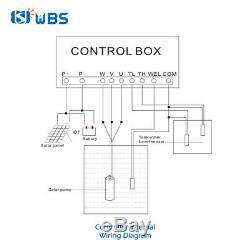 Wire power cable (2 wires plus earth). We recommend cable size at least. Original cable in the pump. 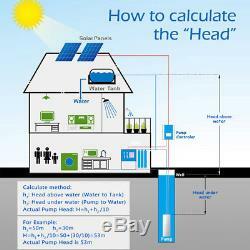 If the pump is only working in the sun, you can connect the solar panels directly, without the need for a battery. 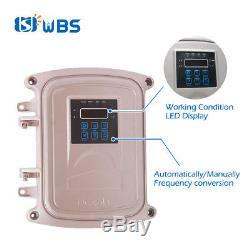 If the pump also needs to work in the evening or on rainy days, you also need to use the battery and the controller. Due to the manual measurement, there might be some error. If for some reason there is. Every single item will be carefully packed as we take that seriously. Because transit time is highly depended and provided by postal service (except weekends and holidays). We want the item to be delivered as soon as you expect. Please check the package when you received. The item must be in the original package and new condition, uninstalled or unpacked. Item is damaged in transit. Item is lost in transit. Or Resend a new one after the item is back. Over 10 Years + Factory Pump Industrial Experience. Best Price Matching The Qualified Parts. US 9:00PM - 5:00AM. UK 2:00AM - 10:00AM. Russia 5:00AM - 1:00PM. AU 1:00PM - 9:00PM. Germany/France 3:00AM - 11:00AM. Special circumstances will be listed clearly in the listing. Please do check everything carefully after you received the parcel. The damage except DOA (Dead-On-Arrival) would not be covered if it's your fault. Do not mix the positive (+) and negative (-) connection. Do not operate for a. Time when there is no water in the pump. PS: 6 mm2 or 10 mm2 copper wire is required when the cable length is too short. 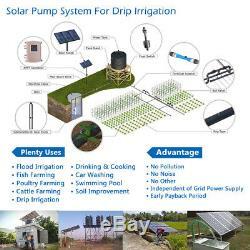 The item "3 DC Deep Bore Well Solar Water Pump 110V 2HP Submersible MPPT Controller Kits" is in sale since Sunday, July 15, 2018. This item is in the category "Business & Industrial\Hydraulics, Pneumatics, Pumps & Plumbing\Pumps & Pump Accessories\Deep Well & Borehole Pumps". 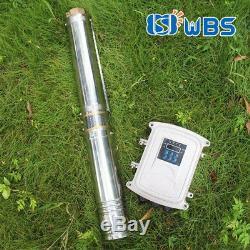 The seller is "wbssolar" and is located in Ningbo. This item can be shipped worldwide.